Should Khan move up to welterweight? By Gerardo Granados: WBA World light welterweight champion Amir Khan (25-1, 18 KO’s) is being avoided by the IBF light welterweight champion Zab Judah and WBC – WBO light welterweight champion Timothy Bradley, and even Erik Morales is avoiding him. Bradley got off the hook by declining the offer made to him for the fight. It was reported that Judah turned down an offer to fight Khan because he wants bigger names and aims to get a shot at Manny Pacquiao. Well, that sounds like if he does not want to be exposed before securing a big retiring puse. Morales also turned down an offer to fight Amir. Maybe he was not interested because he knows that Khan has too much speed and mobility for him to handle. Khan is a good boxer but he is beatable; he has great speed and mobility and is also an accurate puncher. His suspect chin resisted the power shots from Marcos Maidana, who is supposed to be a terrific puncher. Amir is a worldwide known boxer. His future fights might guarantee a good purse. He is beatable, and has good defense but has flaws. He is not a power puncher who can end a fight with a single shot. If Maidana was not a one dimensional fighter he could have stopped Amir. Then why is he being avoided? If he keeps being avoided then will he be forced to move up to the welterweight division to get the fights that he needs because at light welterweight he can not get them. Bradley proved not to be the best light welterweight by opting not to not fight Khan, and Judah is doing the same, giving the distinction to Amir who is the only one who has tried to prove he is the best by challenging the other weight champions in order to unify the division. 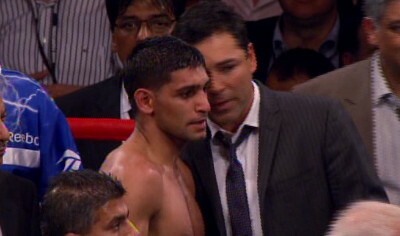 Khan has little to prove at the light welterweight division because he is being avoided without any valid reason. In my view, he is the best light welterweight but the other “champions” aren’t allowing him to prove it. Should he move up to welterweight where the mix of fighters is interesting? He does has the size and skills to compete in the division. He might be able to defeat International Boxing Federation (IBF) welterweight champion Jan Zaveck or WBA World welterweight champion Viacheslav Shenchenko. A fight against the brave WBC welterweight champion Victor Ortiz would be a good one. Khan could even be “competitive” against the WBO welterweight champion Pacquiao becase of Khan’s speed and mobility. All I can say is that Khan is the legit light welterweight champion unless the others who are called “champions” can prove he is not. Is he? Boxing » Amir Khan » Should Khan move up to welterweight?